While researching the Groves Chapel, I found this image, a postcard showing the area of Clarence Street in front of the chapel, from around 1900. 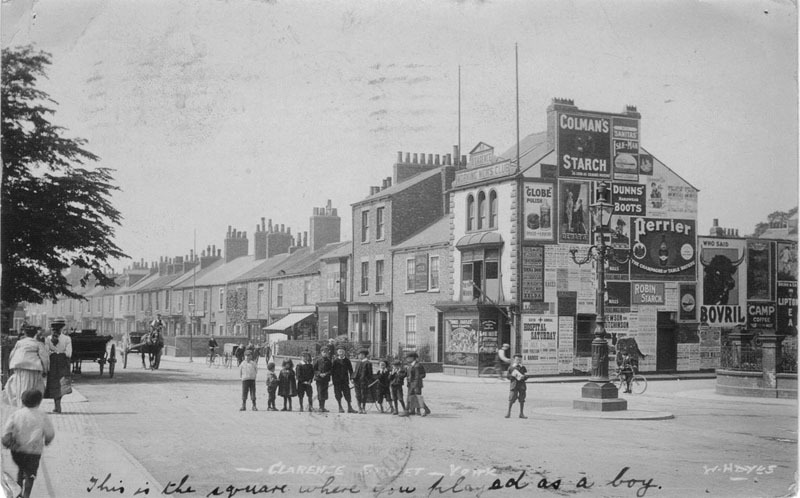 The postcard image is interesting in itself, but making it particularly special is the handwritten caption: ‘This is the square where you played as a boy’. Maybe sent, a century or so ago, from a parent to a grown-up son. Most striking, in that one line, is the word ’square’. To us, now, this is a road junction. The idea that it was ever seen as a square seems ludicrous, as does the idea of children playing here. Google captured it at a quiet time of day. Often it has standing traffic at the lights in all directions. This wider view includes Groves Chapel on the right. The street lamp has been replaced by traffic lights and the children have been replaced by a traffic island.